1. 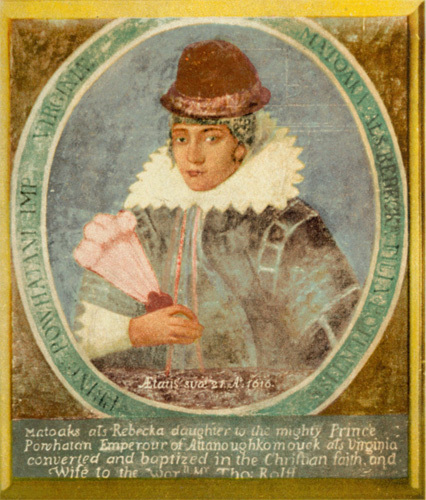 Pocahontas in England in 1616 or 1617: Pocahontas’ Sister, Cleopatra, may have been an ancestor of Davis Floyd. 2. 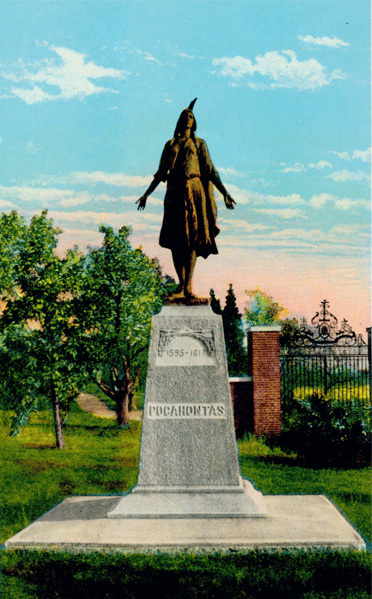 Pocahontas (1595-1617) Statue on Jamestown Island, Virginia. Another Indian princess named Nicketti may have also been an ancestor of Davis Floyd. 3. 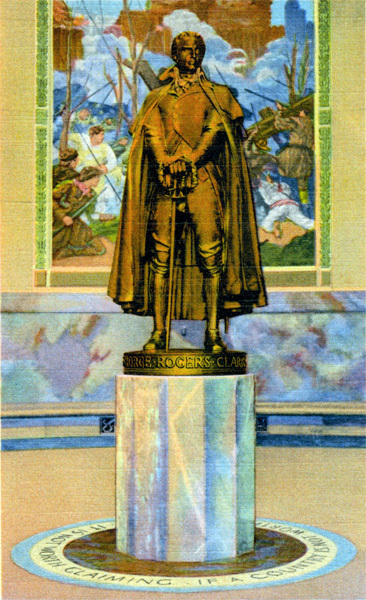 George Rogers Clark Bronze Statue in Memorial at Vincennes, Indiana. 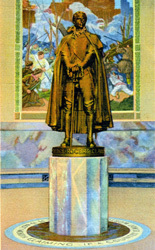 The statue of a young George Rogers Clark is more than nine feet in height. Clark was commissioned by Gov. 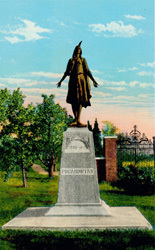 Patrick Henry of Virginia to capture the British forts at Kaskaskia and Cohokio and was successful in this enterprise by taking both of these towns in July 1778 and by taking Vincennes on February 25, 1779. He was born in Virginia in 1752 and died in 1818. He is buried in the beautiful Cave Hill Cemetery in Louisville, Kentucky. 4. 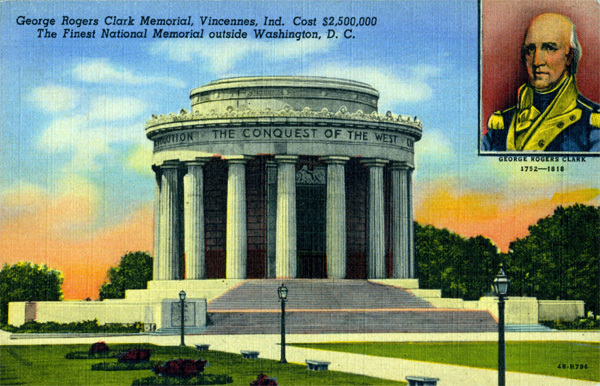 George Rogers Clark Memorial at Vincennes, Indiana. 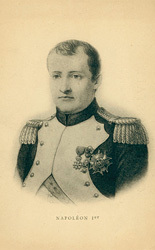 Clark is shown as an older man in uniform in the inset. 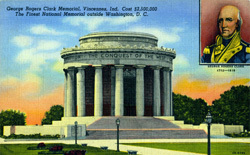 The Memorial celebrates the winning of the old Northwest which includes the modern states of Ohio, Indiana, Illinois, Michigan, Wisconsin, and part of Minnesota. 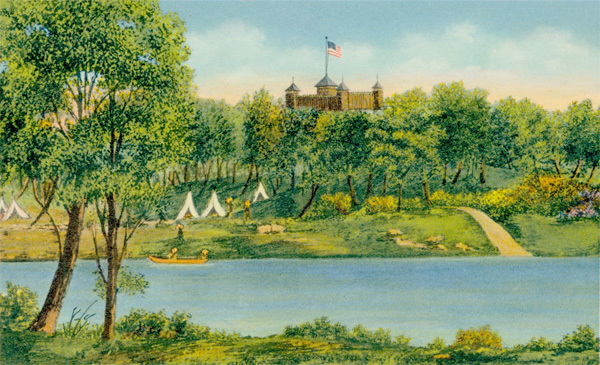 Clark and his small band of 170 soldiers captured old Fort Sackville and caused the British to surrender on the morning of February 25, 1779. This was more than two and a half years before the surrender of Cornwallis to George Washington. 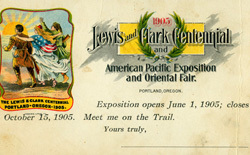 Clark’s achievement opened the way to the west. Davis Floyd as a small child moved to Louisville, Kentucky with his family in the latter part of 1779 and the Lewis and Clark Expedition left the Falls of the Ohio at Clarksville in 1803. 5. 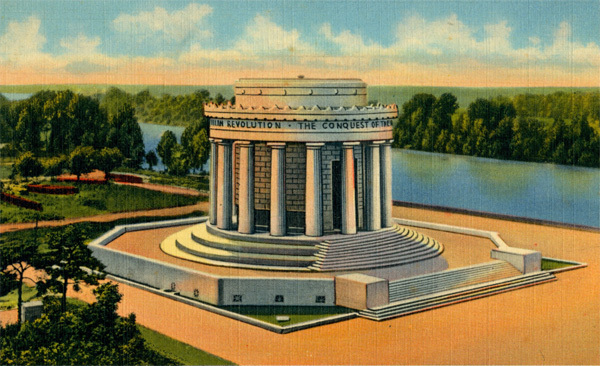 Another Scene of the George Rogers Clark Memorial at Vincennes, Indiana. 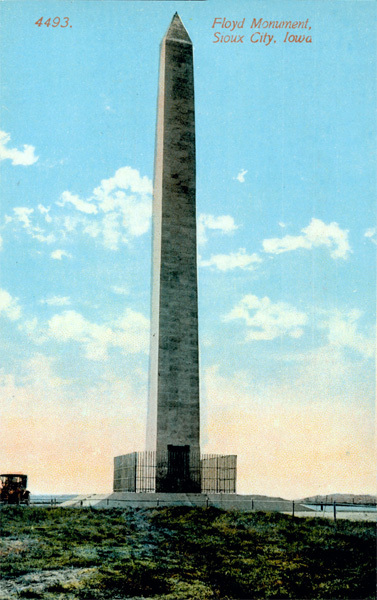 The Memorial was erected on the site of Fort Sackville at a cost of $2,500,000.00. 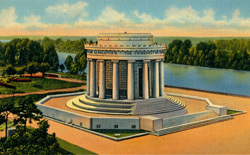 The Wabash River can be seen behind the memorial. 6. 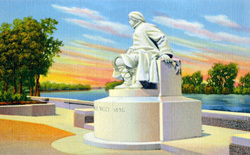 Col. Francis Vigo Granite Statue in Memorial Grounds on the Wabash River at Vincennes, Indiana. Vigo and Father Pierre Gibault materially aided Clark in his and his soldiers conquest of Fort Sackville. Vigo was an officer in the Spanish army. He was a fur trader whose best customers were the local Indians. Despite his financial aid Vigo died a pauper. Vigo was born in 1747 and died in Vincennes in 1836 where he is buried. Vigo County, Indiana is named for him. 7. 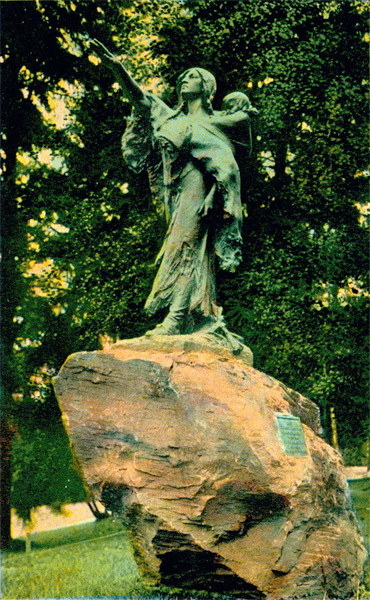 Sakakawea Statue, The Shoshone Bird Woman, at Bismarck, North Dakota. 8. Sacajawea Statue in City Park at Portland, Oregon. 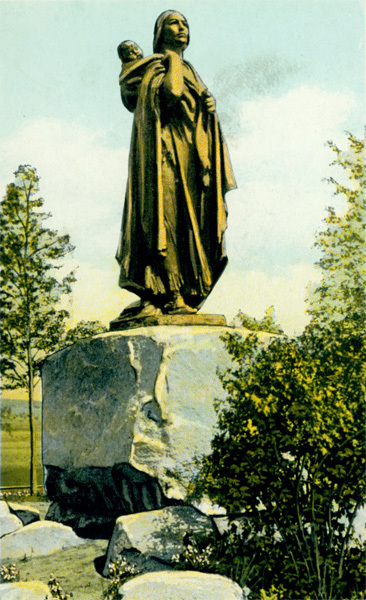 This statue was dedicated by Susan B. Anthony during the 1905 Lewis and Clark Centennial and American Pacific Exposition and Oriental Fair held in Portland, Oregon which opened on June 1, 1905 and closed on October 15, 1905. 9. 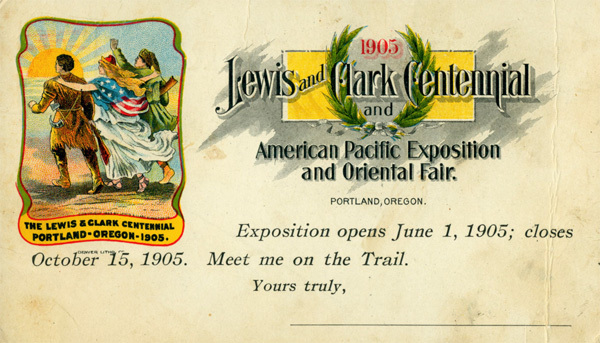 Advertisement for the Lewis and Clark Centennial Exposition in 1905. 10. 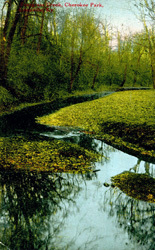 Beargrass Creek in Cherokee Park in Louisville, Kentucky. Davis Floyd moved from Virginia in 1779 at the age of five years and lived with his family on Beargrass Creek at or near the sight in this postcard until he married in 1794 and may have lived there thereafter until he and his family moved to Indiana in 1800. 11. Ohio River Falls (Falls of the Ohio) between Louisville, Kentucky and New Albany, Indiana. 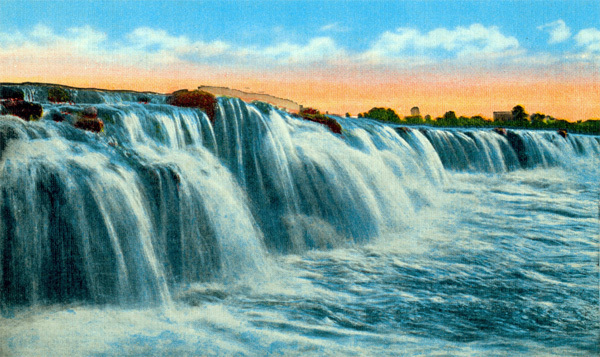 Davis Floyd as a commissioned Falls of the Ohio pilot would have guided boats through the Falls in both low water and high water. This scene shows a medium water level. 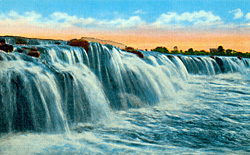 Later on John J. Audubon sketched birds at the falls. In one of his journal entries he describes a hunter, his steed, and his dog hunting Canada geese at the falls. While Audubon mentions the name of the dog, Nep or Neptune, he does not mention the name of the hunter. The author speculates it could have been Davis Floyd. 12. 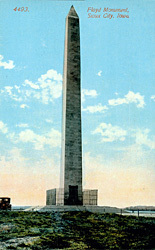 Charles Floyd Monument at Sioux City, Iowa. Sgt. Charles Floyd was the younger brother of Davis Floyd. 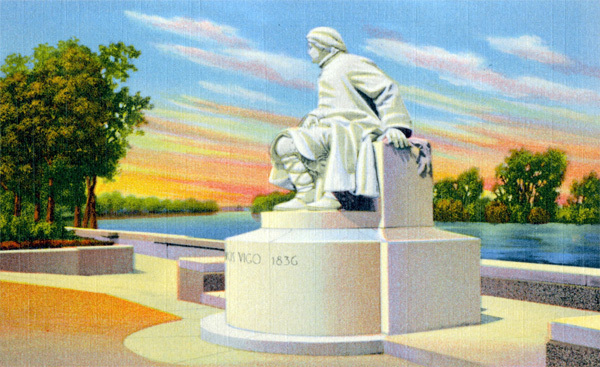 This monument is the largest monument of any memorial honoring members of the Lewis and Clark Expedition. He died on August 20, 1804 probably from the complications of appendicitis. 13. 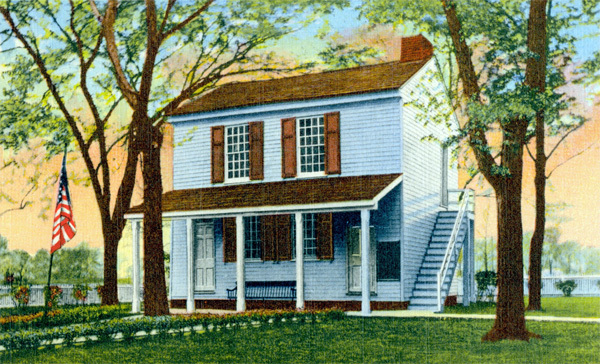 First Capitol of the Indiana Territory and the District of Louisiana at Vincennes, Indiana. In 1805 Davis Floyd was elected by the eligible male voters of Clark County to the Territorial House of Representatives which met in this building during the summer of 1805. 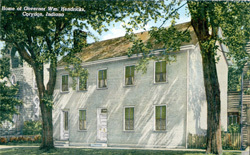 The first Indiana Territorial laws were enacted herein. 15. 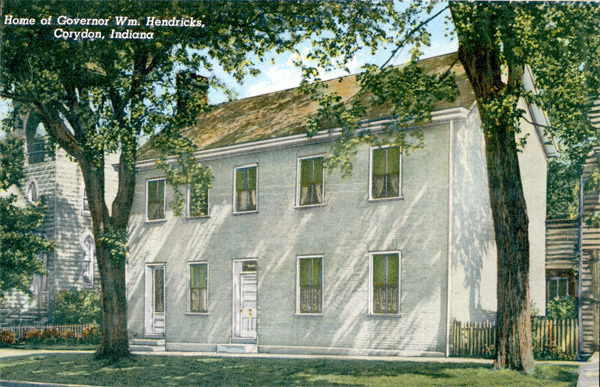 Grouseland-The White House of the West and the House in Which Gen. William Henry Harrison Lived While Governor of the Indiana Territory. 16. Early Scene of Fort Knox on the Wabash River near Vincennes. Zachary Taylor, Afterwards President of the United States; He Was in Command of the Fort in 1811. 17. 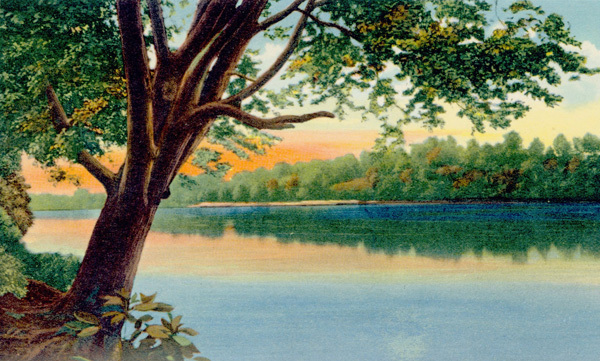 The Beautiful Wabash River at Vincennes, Indiana, for Years an Inspiration for Authors, Poets, and Song Writers. 18. Old State Capitol Building in Corydon, Indiana. 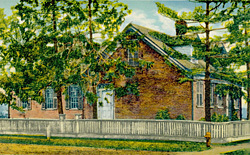 Davis Floyd was one of the commissioners who built this building in 1813. It housed the Governor, the Indiana Supreme Court Justices, and the members of the General Assembly. 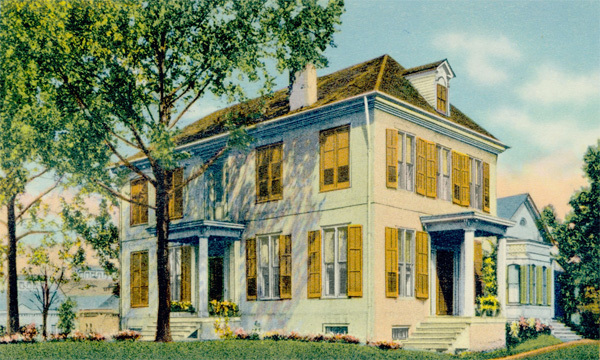 It served as the Territorial capitol from 1812 until 1816 and then as the state capitol from 1816 to 1825, when the capitol was moved to Indianapolis. 19. 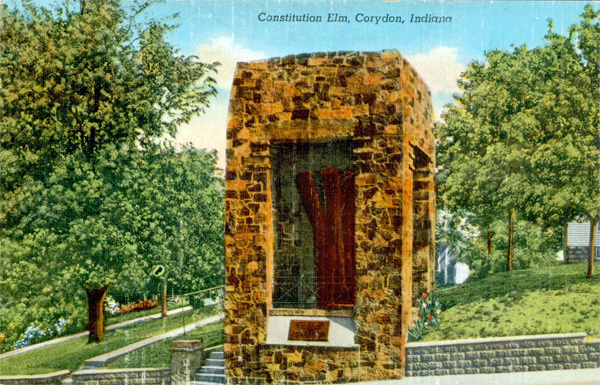 Constitution Elm in Corydon, Indiana. 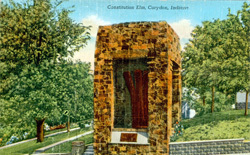 During the hot days during the summer of 1816 members of the Constitutional Convention, including Davis Floyd, moved out of the Capitol building to draft the terms of the Indiana Constitution under the shade of this great elm tree. 20. 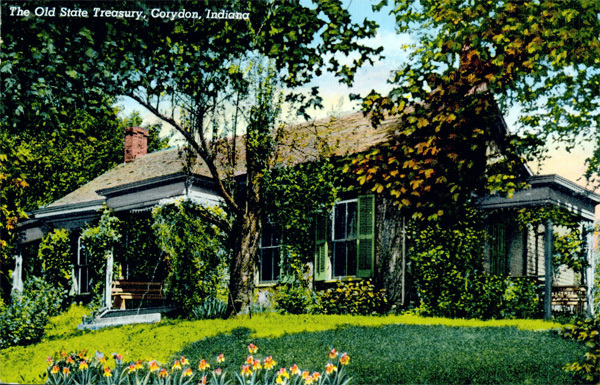 Governor William Hendricks’ Home in Corydon, Indiana. He served as Governor from 1822 until 1825. 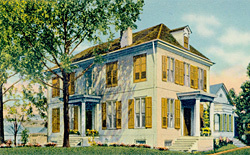 Davis Floyd built this home in 1819 but he and his family, who lived there, eventually lost the home to foreclosure in 1822 because of the Panic of 1819. Floyd cut his losses by moving to St. Augustine, Florida Territory in 1823. 21. 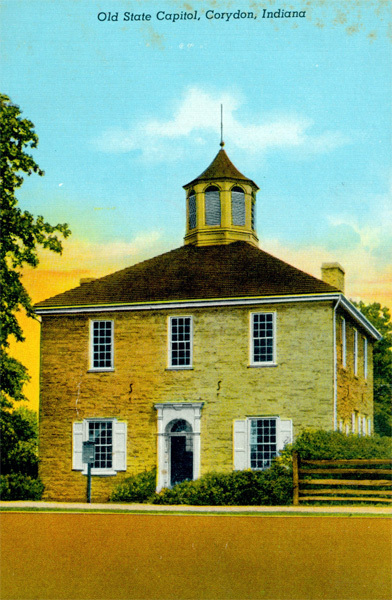 The Old State Treasury building in Corydon, Indiana. This old brick house was built in 1817 by Davis Floyd. 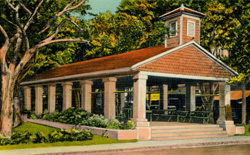 The cellar was used as the state treasury vault. While Davis Floyd was the president judge of the 2nd Judicial Circuit from 1817 until 1823, he had been treasurer of the Territorial government from 1813 until 1816. He would later serve as the Florida Territory treasurer in Tallahassee, Florida Territory, from 1826 until he died in 1831. 22. 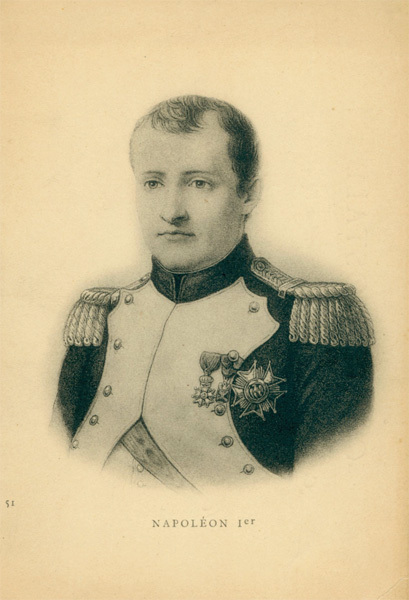 Napoleon Bonaparte 1st. 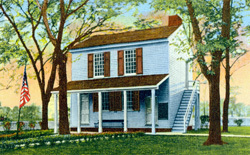 As president judge of the Floyd Circuit Court in 1821 Davis Floyd conducted the murder trial against John Dahmen, an immigrant from Germany who brutally murdered a baker in New Albany, Indiana in 1820. One of Dahmen’s lawyer, Reuben Kidder, wrote a book about Dahmen’s pre- execution life in Europe and America. While in Europe Dahmen went with Napoleon to the Russian front near Moscow and then fought against Napoleon in the Battle of Waterloo. 23. 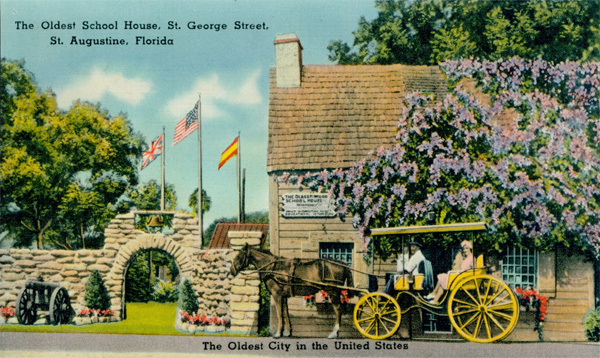 Oldest House in America at St. Augustine, Florida. 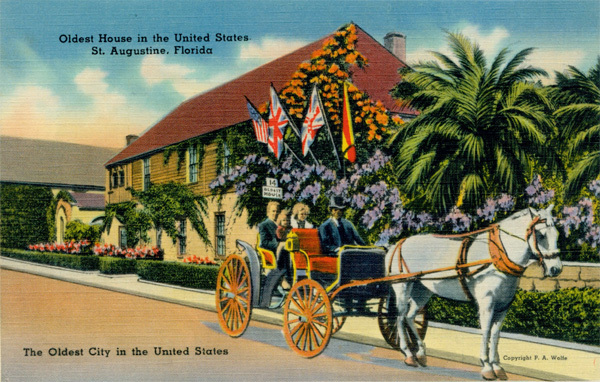 Davis Floyd and his family moved from Corydon, Indiana to St. Augustine in 1823. He had been appointed a federal land dispute judge in that town by Pres. James Monroe. He served in that position until early 1826 when he then moved to Tallahassee where he became the Treasurer of the Florida Territory. 24. Another Scene of the Oldest House in the United States. St. Augustine is also the oldest city in the United States. Davis Floyd was probably in this house at some time. The flags of the countries who owned Florida at different times can be seen in the center of the post card picture. 25. 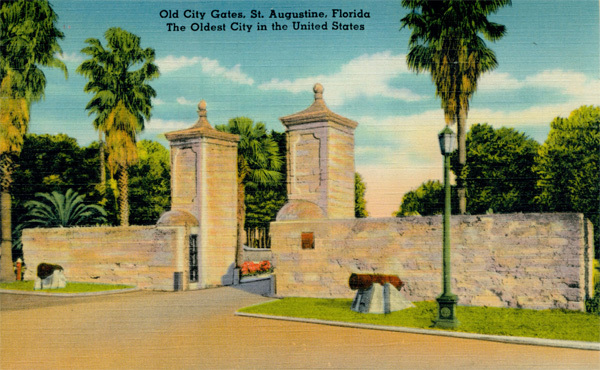 The Old City Gates of St. Augustine, Florida. Davis Floyd and members of his family walked through these gates many times. 26. 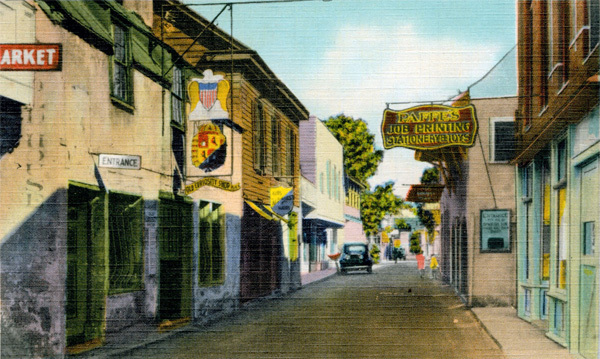 Quaint Old St. George Street in St. Augustine, Florida. The land dispute judges, Davis Floyd, Alexander Hamilton, Jr., and William Blair, probably lived on a street such as this during their service there. 27. 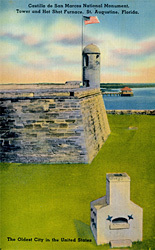 Castillo de San Marcos National Monument, Tower and Hot Shot Furnace (in the foreground). Davis Floyd probably wandered through the grounds and walls of the fort. 28. 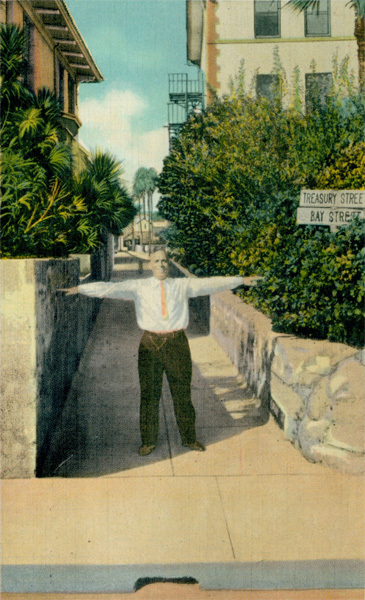 Treasury Street, the Narrowest Street in the United States. The street is seven feet wide. 29. 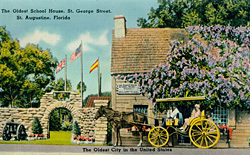 The Oldest School House in America on St. George Street in St. Augustine. 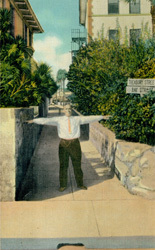 Davis Floyd was a promoter of education in the Florida Territory. He was a charter member of the Florida Education Society organized in 1831 and was its first president. 30. 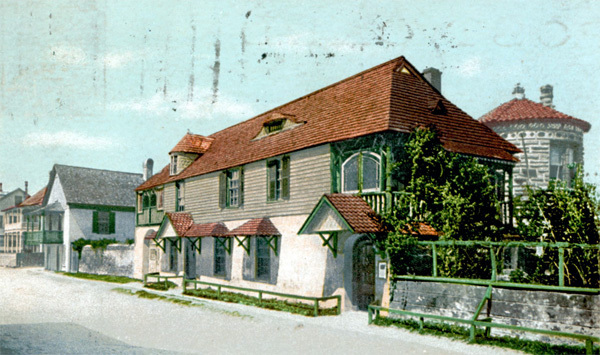 The Old Market in St. Augustine. Floyd owned a slave in the Florida Territory when he died. It is possible he bought this slave at this market. 31. Seminole Indian Family in a Dug-Out Canoe on the Miami River, Florida. 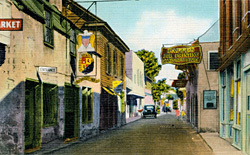 Davis Floyd probably saw scenes such as this in his travels as a lawyer in the Florida Territory. 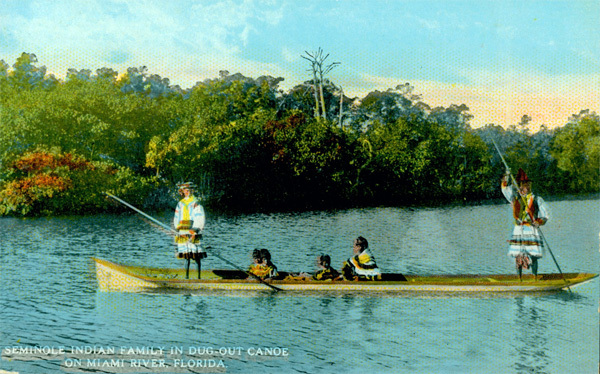 The Seminoles in Florida were treated like Indians were treated in the Indiana Territory. The eventually revolted and were liquidated by white men.